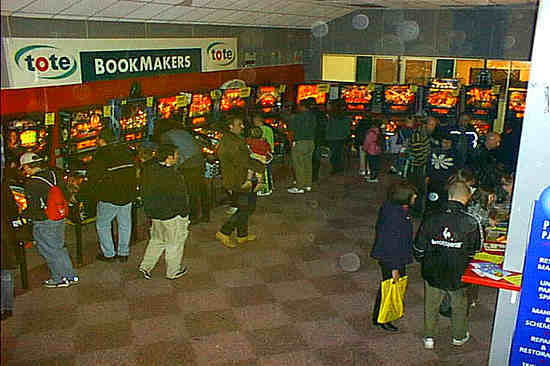 And so it was on a wet October morning that Jukebox Madness took place at Ascot Racecourse in leafy Berkshire, England. 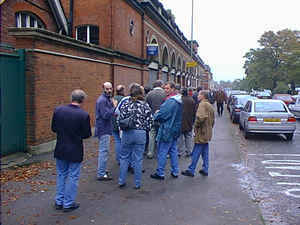 ...yes, the Great British Queue. It took about 10 minutes to make it through the turnstiles and into the show. When leaving at about 2pm, there was no queue but by then only a few hours of the show remained. Entry cost £6 per adult (£3 per child) or a family ticket for £12, though the size of the "family" wasn't defined anywhere. Not surprisingly, with a name like that the show is mainly about jukeboxes, and credit where it's due there were hundreds of the things. Prices ranged from about £500 up into the thousands and there were some excellent machines on sale. 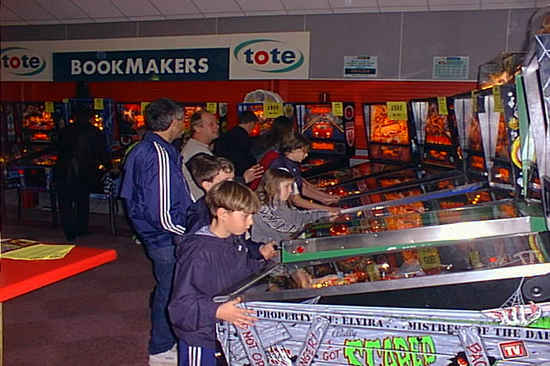 It's easy to get caught up in the atmosphere of a show like this, and the £500 model was a tempting buy for the games room, but sense prevailed. 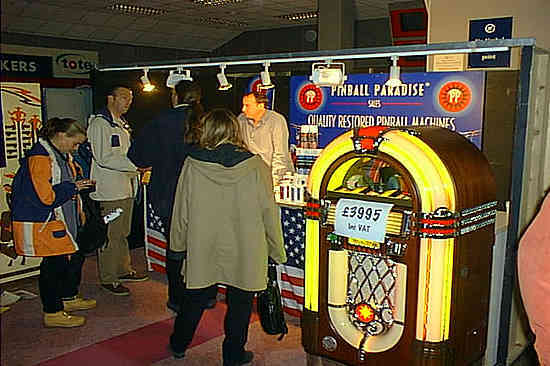 Besides the aforementioned jukeboxes, there are the accompanying record sales and anything vaguely American seemed to be fair game. Old Bakelite US radio shells sold for £20 each, and there was just about any phrase you could name printed on fake car plates. But enough of that, what about the pinball games? First game spotted as you walk through the door (Ouch! Must open it next time) is this rather nice Bally Future Spa priced at £350. From there, it's onward towards the main body of pinball games, but what's this? 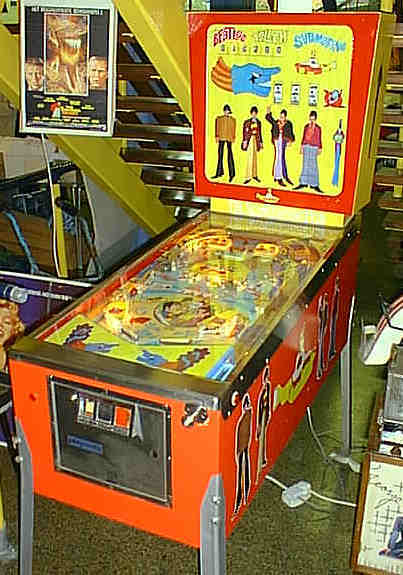 Naturally, in a collectors fair such as this there's going to be some Beatles memorabilia and that includes this Beatles pinball. The Beatles - Yellow Submarine was a new one to me. Not being a big fan of electromechanical games this might have been the Addams Family of EM games for all I know, but I'd never seen one before and this one looked in good condition. 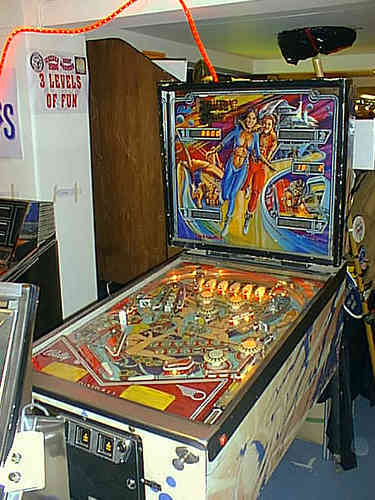 The only other pinball interest of the show was the feast presented by Pinball Paradise. While there was little of interest on sale at the booth (a few rubbers, balls and cans of cleaning solutions) the line-up of games was an entirely different matter. To save you from counting, that's 29 games covering a large number of years. Those last six Bally games were in a separate bank from the rest and looked superb, getting as much play as any of the modern DMD games. Most of the games were for sale, but the current prices are best obtained from Pinball Paradise's web page, found in our Links section. These games were very busy all day which encouraged players to hang onto a game once they'd found one available. 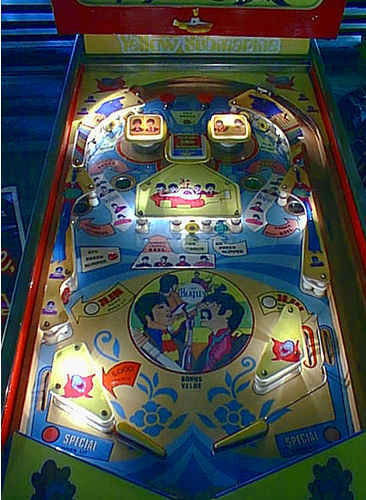 All games were on freeplay, though a couple of the older Gottliebs didn't have any credits on them and were unplayable. 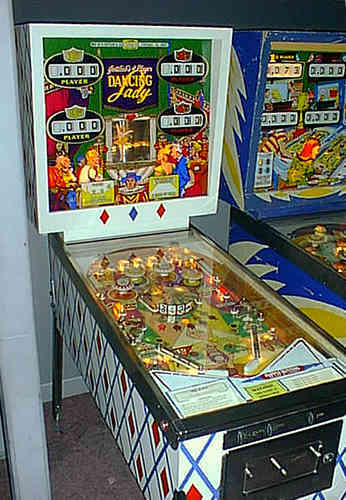 All the games were in excellent condition even the older Ballys and Gottliebs which made them as much fun to play as the more complicated modern games. One feature that stood out was the number of children playing the pins. 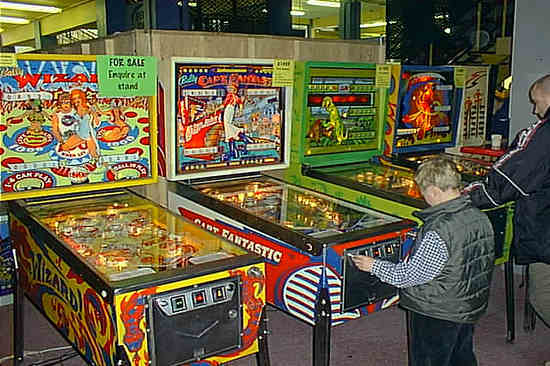 Parents may have come to the show for the jukeboxes or memorabilia, but the kids sought out the pinball games. Let's hope this helps keep pinball appeal to the next generation of players. So, a great show for pinball fans. Credit must go to Pinball Paradise for an excellent selection of old and new games (though perhaps a Pinball 2000 game might have topped things off), and the great condition they were in. See the Diary section for details of next year's shows.